At YardKit, we help homeowners reimagine their outdoors to enjoy beautiful outdoor living spaces. Email us at hello@yardkit.com with any inspiration you’d like to see. Craving a cozier feeling coming home? With evenings coming faster and the days of summer sun further behind us, your yard may move down the priority list as outdoor spaces become a little less useful. Though the fall and winter months ahead may actually be the best time to spruce up your property—think of the holiday visitors heading to your doorstep. A few easy changes to your front porch can maximize curb appeal this autumn. Whether or not you plan to put your house on the market, a simple refresh with a nod to the seasons will go a long way. 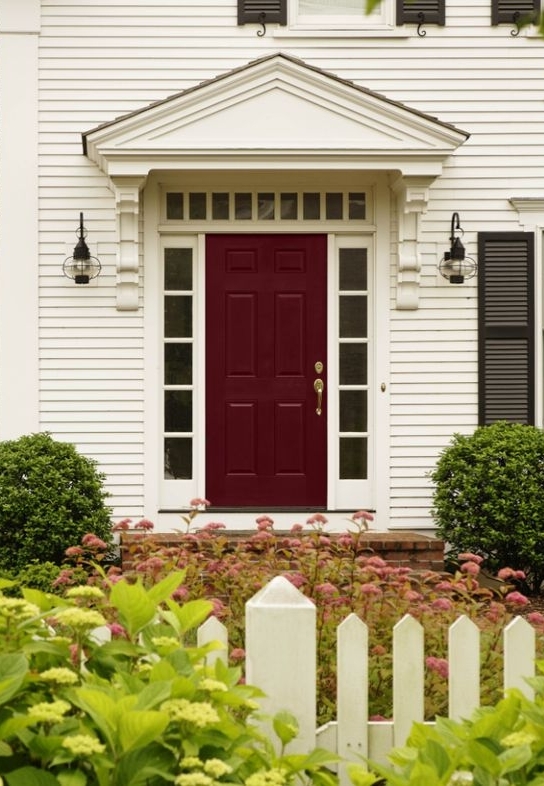 In fact, a welcoming entry can boost home values with return on investments of 150% or more. This moody, reddish-burgundy hue achieves that perfect balance of on-trend without trying too hard. As changing seasons clear out surrounding foliage, this hue will really pop. Oxblood works beautifully with crisp, white siding or house facades in earthy materials like weathered wood and stone veneer. If you’re planning other front yard renovations, our designers recommend travertine or a “full range” bluestone, which blends warm undertones of tan and rust into the classic blue hue. Lean towards polished metal finishes like pewter or antique nickel for hardware and lighting. Straw-colored accessories, from doormats to hung wreaths, evoke the charm of the season. Fold in plants with complimentary hues of jammy red and hunter green. Shrubs and perennials like purple Chinese fringe flower (Loropetalum chinense), breath of heaven (Coleonema pulchellum), New Zealand flax (Phormium tenax), and hopseed bush (Dodonaea viscosa 'Purpurea'), will look great under sculptural trees like Degroot's Spire Arborvitae (Thuja occidentalis 'Degroot's Spire'), Italian cypress (Cupressus sempervirens), and hornbeam (Carpinus betulus 'Fastigiata'). Elevate your seasonal porch decor by swapping the usual orange pumpkins for some with a dark or metallic twist. For the fresh and fun crowd, there’s no more welcoming entry than a cheerful, marigold accent color. This mustardy-yellow hue offers a unique twist on the popular farmhouse look and works well alongside most house colors, especially slate gray, creamy white, and dark taupe. Consider surface materials with warm tones and natural origins. Dark wood, like Ipe or stained timber, creates an inviting front porch or deck. Creamy colored flagstone is a friendly compliment for entry walks. Path fines (also called decomposed granite) or a fine-grained pea gravel in warm gray tones would be great choices for casual patios and walkways. These aggregates also work well between stone pavers. Add extra personality with silver-toned light fixtures, house numbers, and planters. Metal accents in galvanized steel will lend a more rustic feel to your front door, while white enamel has a more urban look. Both work well alongside plants grouped in large clusters—our designers often use seven to nine of single species. Dark greens and big blooms work well en masse — think hydrangeas in cool climates, and ornamental meadow grasses in warmer areas free of winter frosts. Complete the cheerful aesthetic with plants that make a more dramatic statement at the moment of entry. Graceful trees like Japanese maples (Acer palmatum), Chinese pistache (Pistacia chinensis) or Wilson fruitless olive (Olea europaea 'Swan Hill'), and low-growers with lots of personality, like aeonium or foxtail fern (Asparagus meyeri), will up the fun quotient without stealing the show. The orange and yellows of autumn plants shine in this scheme, so don’t forget the gourds! Let the warmth of natural wood shine for a warm, stately look. This style works well for houses with whitewashed brick, siding in neutral colors, or crisp, white stucco. For adjacent surfaces, natural materials with sandy undertones offer a beautiful compliment to natural woods. Consider brick or a square-cut local stone, like travertine or bluestone, for entry walks and front stoops. A compacted gravel made from crushed rock is a favorite for informal driveways and pathways. Our go-to choices, pea gravel in “Salt and Pepper” or “Blue Chip”, are likely at your local landscape supply store. Round out the welcoming feel with simple accessories in blacks and tans. Wrought iron is ideal for new hardware—doorbells, sconce lights, and glowing lanterns creating an inviting entry. Keep plants simple with a range of glossy greens, dusty blues, and deep plums. An ample foreground of plants with a naturally rounded shape work well along your home’s foundation. Locally-suited varieties of compact laurels (Prunus laurocerasus or Prunus caroliniana) and mock orange (Pittosporum tobira ‘'Wheeler's Dwarf' or ‘Shima') are excellent choices. Accent trees with purple-tinged foliage add polished personality. Redbud (Cercis canadensis or occidentals), purple plum (Prunus cerasifera), and smoke tree (Cotinus coggygria) are designer favorites. Flank your entryway with statement urns in an Old World style to liven up restrained planting. The plants here can change with the season, though, depending on your climate, the combination of a manicured boxwood (Buxus microphylla or Buxus sempervirens) framed by a trailing English ivy (Hedera helix) will create a nice structure with complimentary textures year-round. For a pop of color, add coral bells (Heuchera spp.) in cool, shady areas or purple-tipped echeveria succulents in warmer areas. An heirloom Jarrahdale pumpkin completes the elegant look. These simple moves will keep your home’s exterior looking polished while maximizing your enjoyment of the season.